Parents become grandparents, sisters become aunts, and everything changes with the arrival of a new baby. Celebrate the special occasion with the unique newborn baby gifts for the whole family. You can share baby's handprints, footprints, and fingerprints in classic frames as your child makes their first mark on the world. 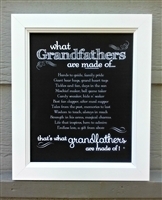 Select a heartfelt poem with a picture of your newborn or a sonogram of your newborn-to-be that grandparents will love to put on the mantle for years to come. These new baby gifts are sure to bring smiles to the faces of your relatives and remind them of the special place they have in your newborn's life. 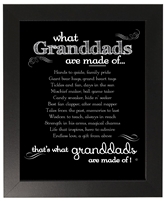 Whether you are looking for family gifts from newborns or a keepsake frame to help new parents commemorate this special moment, you are sure to find what you are looking for in our unique selection. We even have picture frames in pink or blue that will make perfect newborn boy or newborn girl gifts and ultrasound frames designed specifically for twins. Take a look at our selection and you're sure to find new baby gift ideas that speak from the heart.